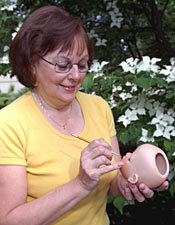 Donna Sabonis – Owner, artist, award winning doll maker & teacher with over 35 years experience crafting and teaching the fine Art of porcelain doll making. Everything from designing & pouring molds, to painting the dolls with her own special blend of colors that are realistic, warm and suble, to designing and sewing beautiful yet authentic doll clothing. Because of my love for dolls and my craft, I enjoy learning about the history and authenticity of both antique and collectible dolls. There is so much to be said for the charm and history of an ANTIQUE DOLL. I handle every doll repair as if she were my own. Each doll has their own characteristics and I enjoy bringing life back into the doll. I strive to keep your doll faithful to it’s original condition while repairing or sewing an outfit for your doll. Donna’s Children has always carried a wide assortment of doll supplies to give diversity to your collectible dolls. Sometimes we all would like our dolls to have a “Do Over” and a great place to start with your doll is a new hairdo and new pair of shoes. Please visit our DOLL GALLERY to see our MODERN, COLLECTIBLE, ANTIQUE, and REPRODUCTION dolls.